[prMac.com] Madison, Wisconsin - OrangeTreeApps, LLC recently launched the L-Card Pro app that introduces eco-friendly, affordable, electronic business cards on the go. The app is welcomed by professionals who are finding it increasingly cumbersome to carry paper cards. The app will solve this problem effectively by allowing users to create, carry, share and manage unlimited business cards electronically on their smartphones and tablets. "L-Card Pro app is designed to help professionals network seamlessly through QR code electronic business card sharing while also allowing users to connect with contacts directly from their business cards and categorize them according to their personal needs. Additionally, users can edit cards to include notes, events & reminders," explains David Chabukashvili, Founder and CEO of the company. The user-friendly app combines a simple, clutter-free interface with powerful features that all professionals will find useful. App users can get started by using a number of preloaded templates or by uploading existing personal paper cards and transforming them to digital ones. "Along with saving business professionals time, the app is also very economical. You no longer need to get a new set of cards printed every time you change your phone number or job. Simply edit your business card on the app and it will automatically update all the cards you have shared via L-Card worldwide," says David. This advanced L-Card Pro app, features unrivaled digital tools including the unique ability to add video clips to business cards. "As content often gets mundane, L-Card Pro allows users to stay relevant by adding videos of up to 30 seconds to each business card! These video clips can be viewed by all contacts. This feature provides an opportunity for users to stand out & gives them the ideal platform to keep information up-to-date," he adds. Additionally, L-Card Pro comes loaded with the award winning OCR card scanning feature to help users to accurately read cards in different languages and convert unlimited paper cards to L-Cards. L-Card Pro also enables users to create CSV files for selected cards, groups or entire libraries and export data to Excel. These files can be used to upload contact information into popular CRM's such as Salesforce, SugarCRM, HubSpot, Outlook, Google Contacts, and more! Moreover, the L-Card Pro app comes with 80 preloaded designs to help users create compelling business cards. Users will also find a selection of advanced editing options to make highly personalized L-Cards. The new version also comes equipped with features that allow users to share their social media links with contacts and also post L-Cards on Facebook, LinkedIn, Twitter, Instagram and other social media sites. The Patent Pending, smart L-Card button email signature add-on enables users to attach business cards to emails for professional and unlimited business card exchanges. Login to your account online at www.lcardapp.com/pro and access all your business cards from anywhere in the world through the web app. Tablet users can display multiple cards on-screen which is ideal for business events and trade shows. Participants and attendees can scan and collect the electronic cards with ease. Additionally, businesses can add branded colors and text to a scrolling screen headline for a professional look. "Today, the world is mobile-driven and it only makes sense to leverage technology for better contact management and networking for professionals. L-Card Pro brings users an impressive array of features in a clean, user-friendly interface. I have 100% confidence that this app will give you all the tools you'll need to manage your business cards electronically," concludes David. 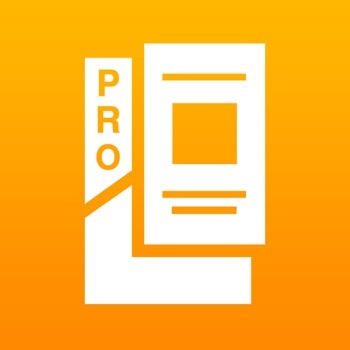 L-Card Pro 1.1 is available for a Free download with Online Subscription at iTunes app store in the Business category. There is also a Web app version. L-Card Pro is also available for Android devices at Google Play Store in the Business category. 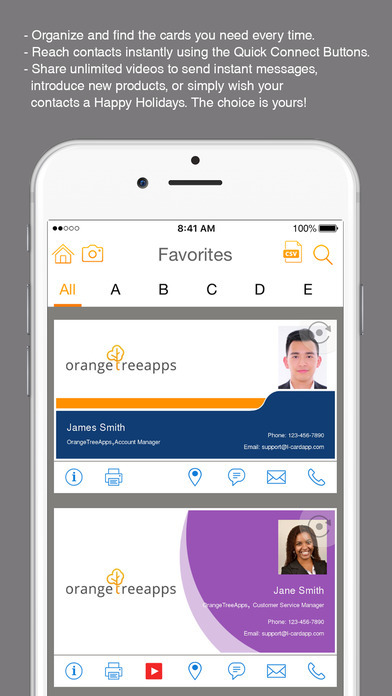 OrangeTreeApps was founded in Madison, Indiana by the team of driven individuals who came together to create products people need. The company creates mobile applications that are simple, innovative and provide a solution to a real problem or add value to the lives of users. All Material and Software (C) Copyright 2017 OrangeTreeApps LLC. All Rights Reserved. Apple, the Apple logo, iPhone, iPod and iPad are registered trademarks of Apple Inc. in the U.S. and/or other countries. Other trademarks and registered trademarks may be the property of their respective owners.